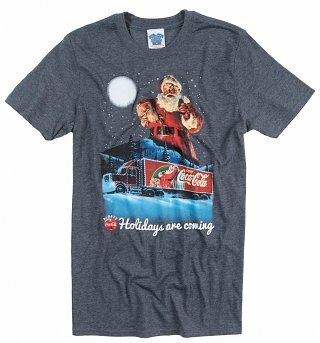 Customer Reviews of "Men's Coca-Cola Holidays Are Coming Christmas T-Shirt"
A lovely-looking tee, but the sizing is very small, with no give. Had to exchange an L for XXL when I always buy L.
Wonderful nostalgic image of Christmas, detail vivid had to change for a bigger size as sizing quoted a little small and then jumps from a 36" chest my son approx 35" that is with room had to order next size up which is 40"
The 'Holidays are Coming' advert always signifies the beginning of Christmas for our family so when I saw someone on the tube wearing a t-shirt with the smiling Santa and the truck on it I had to try and track it down for my sons. I have purchased two of the shirts and they are great - nice quality material and colour. The service I have received from TruffleShuffle has been prompt and email contact with a query was dealt with very helpfully. The website is easy to navigate and I would have no hesitation in recommending both the product and the company. My only problem is that I won't be able to wait until Christmas to give the t-shirts to my sons!! Product as described. Very fast, efficient postage. Would definitely buy again from truffle shuffle. Great t-shirt, I got it for my son for Christmas. I\'m hoping it will be too small for him so I can wear it myself!! arrived on time ,pleased with t-shirt bought as present,would recommend to friends ,your service was good,website easy to navigate for senior citizen,would use again. Made a mistake with sizing, had to send back to get an XL which was my fault, but these guys gave me so much help and made it so easy, Thank you, will def use again. You\'ve help make my Christmas alittle more special this year. I ordered 5 of these t-shirts; 4 in one batch and 1 separately. all arrived very very quickly and all are great. It is this advertisement on tv that makes me realise its Christmas - don\'t drink coke though, just like the ad.\rthanks for a great service!